We hope to see you this Thursday, April 11 for the Salem Release Party at Willamette Heritage Center (Dye House). RSVP today. We have several exciting announcement to share about the new changes with the guide. The page includes the CEU poster and contact information that has been shared at recent Hospital Resource Fairs. Topic: Using Google to show a virtual tour of your business. The following is a preview of some of this month's upcoming professional events, check the Professional Events page for complete details and information on other future events. UPDATED DAILY. Visit the Contact Us page, to submit events for posting. 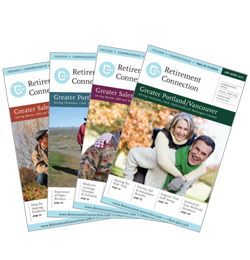 At the last Retirement Connection quarterly sponsor breakfast, many people shared their interest in partnering with other sponsors and providers to gain staff training material, or to provide educational marketing resources. Last year Retirement Connection coordinated 10 hospital resource fairs from Salem to Vancouver. our Sponsors had created 50+ CEU approved educational posters. We have now added those posters to an Education page for others to access and reach out to our sponsors for collaboration. Visit the new Education page on RetirementConnection.com to view thumbnails of each poster, and a contact list. The posters can be viewed full size with a click and you can reach out to the sponsors for additional resources. We are continuing to update and improve the Education web page, but wanted to get a link to you as soon as possible. In a meeting with all seemingly agreeable perspectives, it can be challenging to share a dissenting opinion. It is then rewarding when you find others felt the same way- but were not ready not to speak up, but happy you did. Then it gets tougher, because now there is less control of where the conversation moves. It was easier and cleaner when everyone seemed to agree; but will there be as much discovery? Choose discovery, listen to all opinions, and be willing to change yours.